What the heck is a keyword, or keyword phrase, anyway? First, let’s take some confusion out of it. Keyword, and keyword phrase, are interchangeable – they mean the same thing. 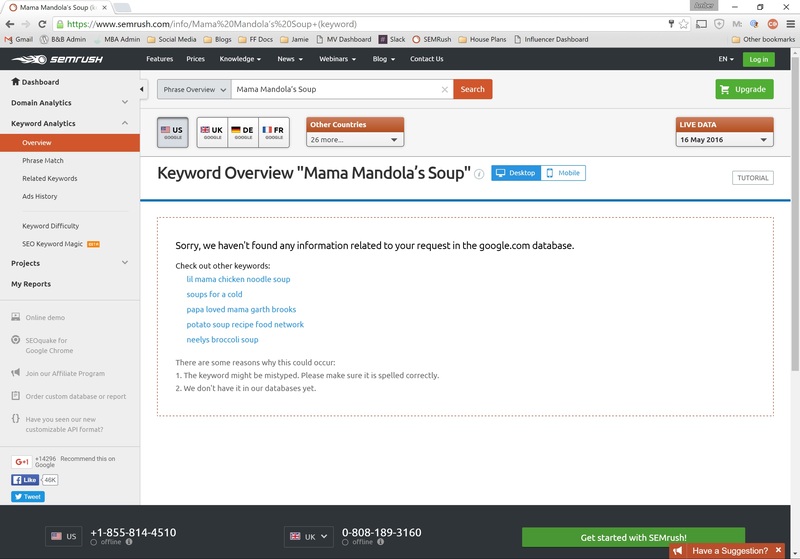 Your keyword is whatever a person might type into Google to find what they’re looking for. That means your keyword could be just one word – “chocolate” – or five: “The best chocolate chip cookies”. So how do I decide the right keyword to use for my post? There are a few ways to go about this. Nagi from Food Bloggers Central has a wonderful tutorial for using the Google Keyword Planner, which is available as part of Google AdWords. You need an account to use this tool, but do not need an active campaign to be running. 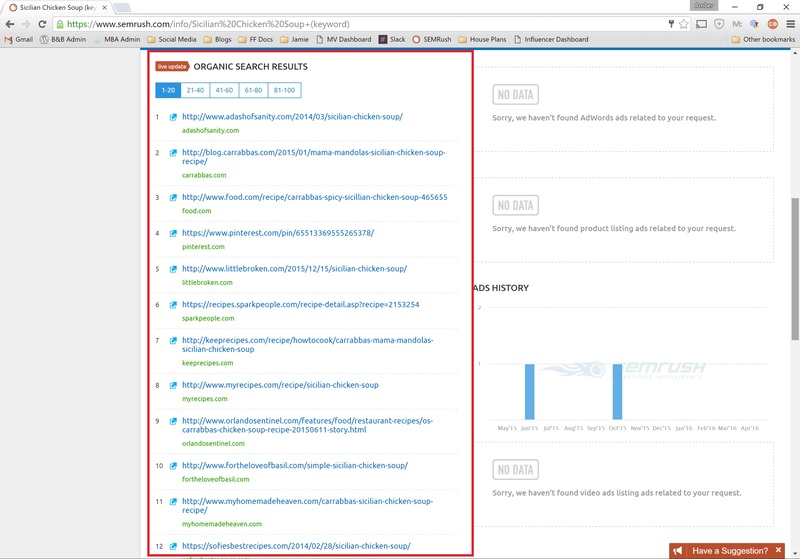 For the sites we run at Mediavine, we use a service called SEMRush. Their paid services start at $70 a month, but we’ve heard success of a few bloggers being able to share an account – you’d share a single login and password. But, they do offer a free research tool too, and that’s what I’m going to show you how to use. Okay, fine, but what makes a keyword right for ME? In general, you want to shoot for a keyword that both has some search around it, and also isn’t dominated by all the big sites in your genre. If something is searched for a million times, but the first 10 pages of search results are dominated by sites like The Food Network, Martha Stewart, and Pioneer Woman, it is not the keyword for you. You must take your site’s traffic level and history into account to compare it with other websites ranking on the term. If you see other bloggers in the top 10 that have been around roughly the same amount of time as you? Give it a shot. Even if there are less searches per month, if you can make it into the top 10 results, you’ll get much more traffic from Google than you would on the larger term with more competition. Let’s practice using the a recent post from Food Fanatic. Originally, the creator, Katie, called the post "Slow Cooker Spicy Italian Chicken Soup". That's where my research began. 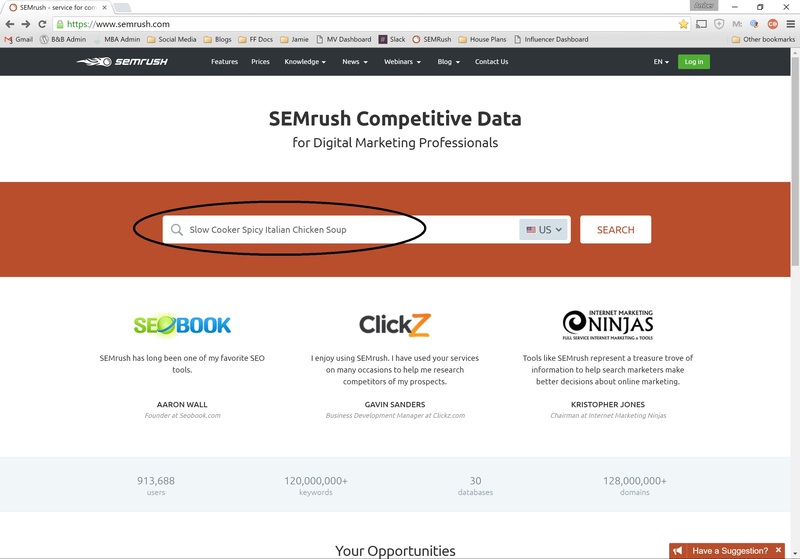 SEMrush isn't telling us that there are no results in Google for that term, but rather that there's no history of Google users searching for this term at any volume. If you've created something super unique? It's worth just using the unique term. 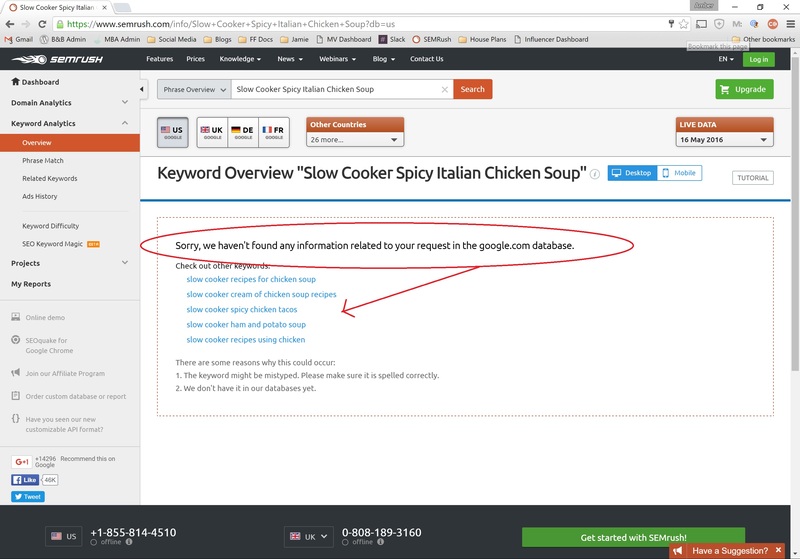 But for something as common as an Italian-style chicken soup, I knew there had to be a more appropriate search term with some volume of search around it, especially because it's a copycat recipe based on soup from Carrabba's Italian Grill. Based on Katie's post, I then searched for Mama Mandola’s Soup - the dish that's served at Carrabba's. It surprised me, but there's no discernable search around the Carrabba's dish, either. So, to Google I went, to get more ideas. 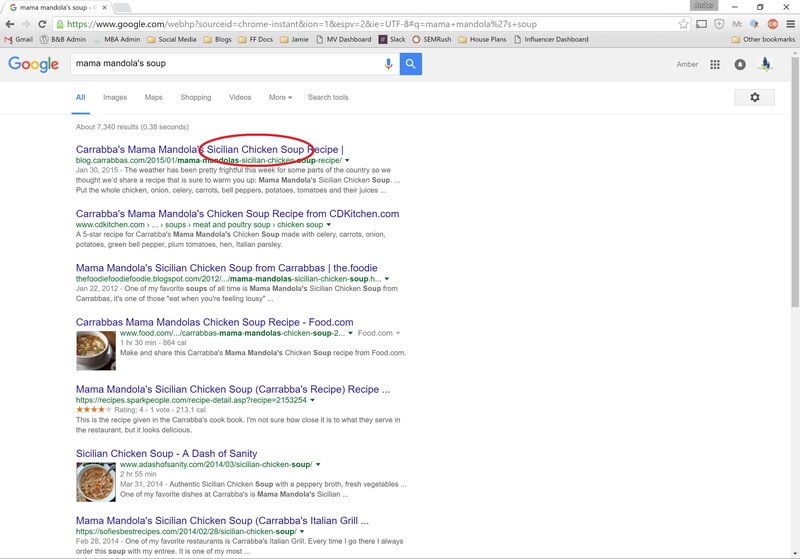 I simply opened a Google window, and searched for "Mama Mandola's Soup". To my surprise, I immediately noticed that this soup is actually from a specific region of Italy. So, back to SEMRush I went! 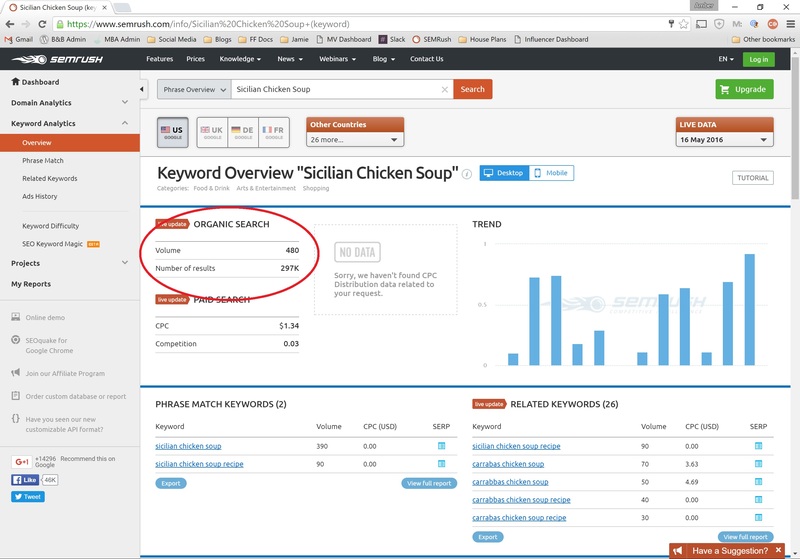 Sicilian Chicken Soup has 480 searches a month! Scrolling down the page, the top 10 sites ranking on the term are listed. This is the same list of results you would get in Google if you searched using an "incognito" window - one that leaves your own personal cookies and history out of the search equation. As you look at them, please notice that many of them are regular bloggers, not giant websites like The Food Network. That makes this keyword a great choice for any blogger! Now let's use your chosen keyword meaningfully in your content. Click on over to our Mediavine Guide to SEO Best Practices.